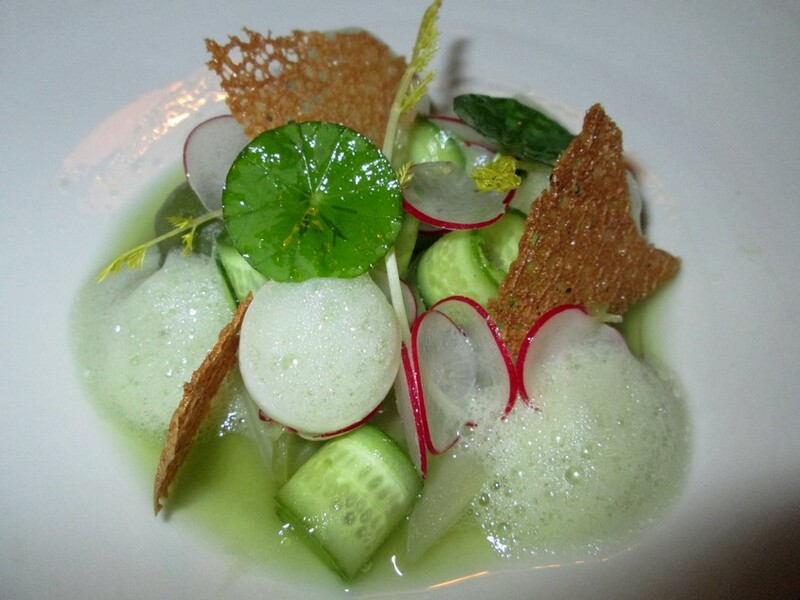 Guest blogger ‘The Bruges Vegan’ selects her three favourite restaurants in Belgium! Before she does, for an excellent overview of veganism, a great place to start is the Positive Health Wellness site, and particularly this article, Embarking on a Raw Vegan Lifestyle. Let us start with underlining how much we love food! Although veganism evokes the image of a culinary desert in most people’s minds (no animal products, no meat, no fish, no dairy, no eggs, … so what do you eat?? ), it has been an enriching culinary journey for us. We have discovered so many new food items and a rich palette of new flavours and combinations. In that respect, you could say we are typical gourmet Belgians: we really enjoy a good varied meal, and yes, a Belgian beer (or two!). Our restaurant visits became far less frequent after becoming vegetarian in the mid nineties. Although most restaurants nowadays standardly offer one or two vegetarian dishes, repeatedly having a salad with goat’s cheese or pasta with stir fried vegetables is not very culinary exciting (we’re being polite here!). So when we went vegan a couple of years ago, we thought our days of dining out would be more or less over. At first glance, it seemed our options in and around Bruges were very scant. It’s not because a restaurant is considered vegetarian friendly, it is also vegan friendly! But gradually, we discovered new places. Even some restaurants with no vegan dishes standardly available, are willing to make a vegan menu, if requested in advance. 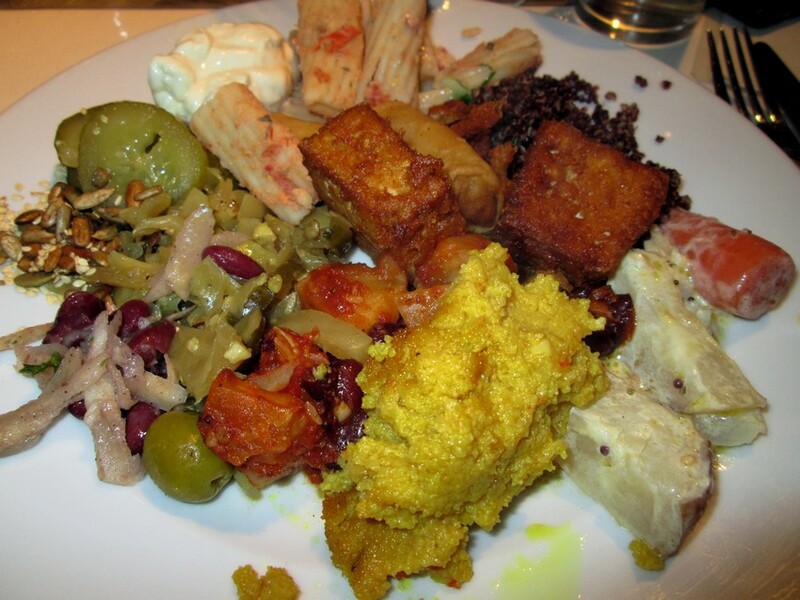 On our blog The Bruges Vegan, we list those restaurants and share our vegan dining experiences. And you can also read about our own culinary experiments and many other aspects of veganism: politics, social theory, activism, economics, culture, health, tourism etc. 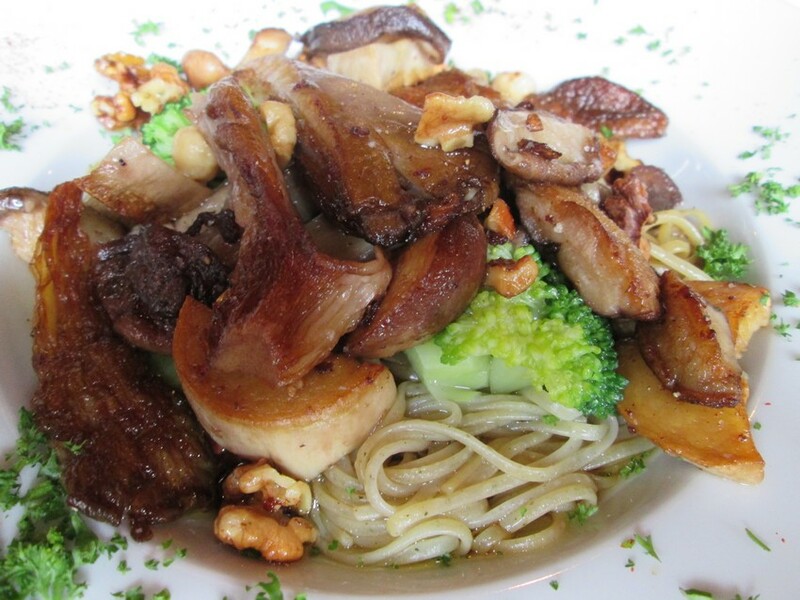 Here are our three favourite restaurants in Belgium where you can get a lovely vegan menu. It is impossible to choose just one favourite, because they are so different. Two are in Bruges, one is in Ghent. From an all you can eat vegan buffet, to a Michelin star restaurant, from a self service establishment to elegant wining and dining, they each have their own style and culinary approach, but we like them equally. Komkommertijd in Ghent is probably the best known vegan restaurant in Belgium. 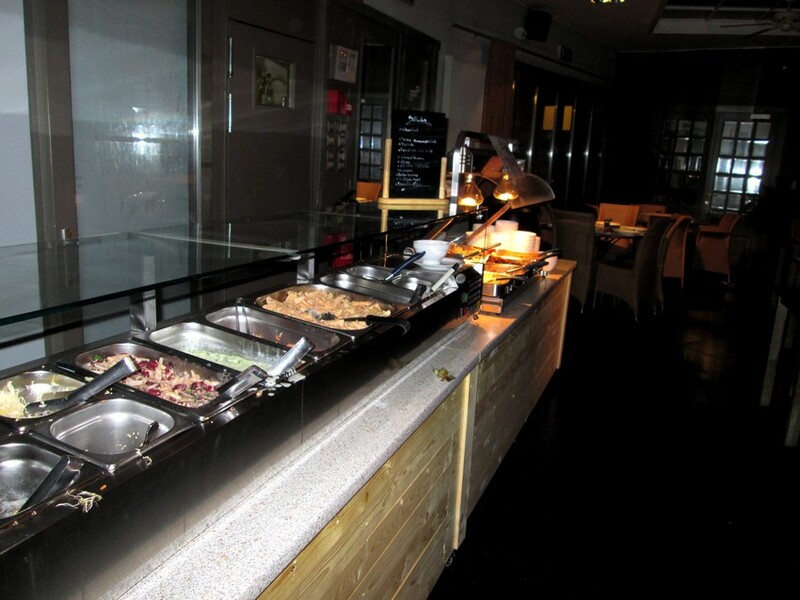 It has an all you can eat vegan buffet, with soup, warm and cold dishes and also a dessert (13,50€ for lunch, 16€ for dinner and in the weekend). You can refill as many times as you want (self service), so definitely the place to go if you have a huge appetite! We’ve been here many times over the years, and find this place good value for money. It is not haute cuisine, and sometimes some dishes do require some more spicing, but there are so many dishes to choose from, you will always find something that is to your taste. See our review of Komkommertijd with more photos. 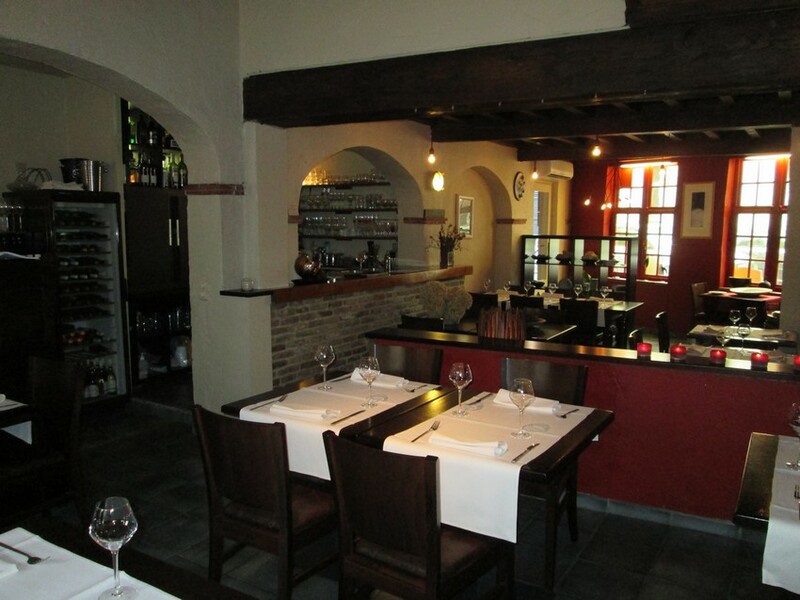 Réliva is the only restaurant in Bruges which standardly has a vegan 3-course menu available (35€). It is not a vegan restaurant, but vegan is always on offer, and besides the 3-course vegan menu, there is sometimes also another vegan suggestion. While some chefs can’t seem to think any further than a pasta with wokked or steamed vegetables, the dishes we have had at Réliva have always been a nice culinary surprise. Service is very friendly and there are several brands of wine that can be ordered per glass. See our reviews of Réliva on this post and this post. Sans Cravate is one of the more classier restaurants (and hence more expensive ones) in Bruges (Michelin*). You can get a vegan menu upon request (ask it a couple of days in advance, when making the reservation). Lunch is 3-course and is 35€. Dinner is either 4-course (60€), 5-course (74€) or 6-course (85€). We’ve been here once for a 4-course menu and really enjoyed it. 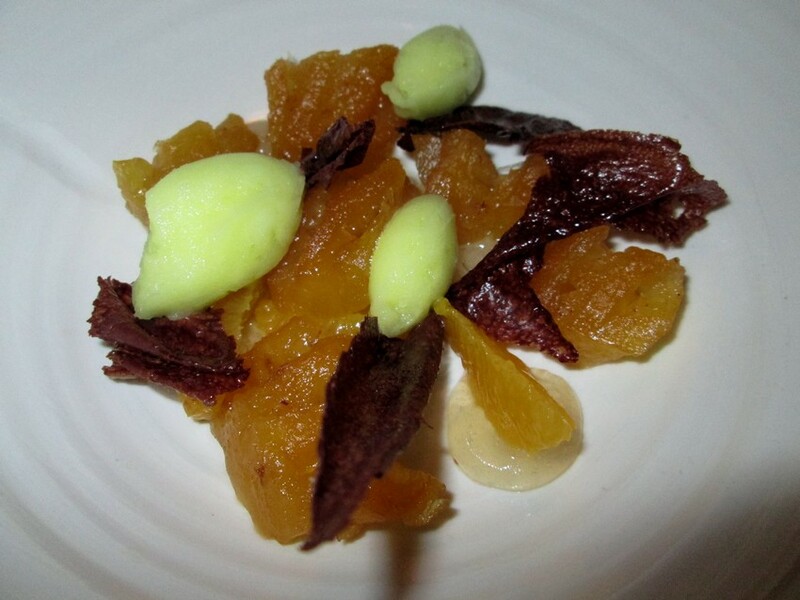 One of the things we really appreciate when going out for dinner is when the chef’s creations give you a new culinary experience: items you have not tasted before, preparations which make you wonder how they can make it so smooth and gentle, combinations of foods we would never have thought of ourselves! We found all of that at Sans Cravate, combined with friendly staff and comfortable seatings. See our review of Sans Cravate in this post. Admittedly, we’ve also had far less exciting dining experiences in some restaurants, and some restaurants straightforwardly tell us they cannot or will not cater for vegans (we also list those on The Bruges Vegan). Some ‘chefs’ still seem to equate a vegan menu with rabbit food, but fortunately we are also discovering more and more places where we can eat creative and delicous vegan dishes. And we enjoy dining out again! We wrote this guestpost on ‘Discovering Belgium’, with our three favourite restaurants!